A historic ship from the World War I era was broken up by massive waves that have slammed the California coast during this weekend's storm. The East Bay Times reports that strong waves on Saturday broke the S.S. Palo Alto's stern from the rest of the boat. 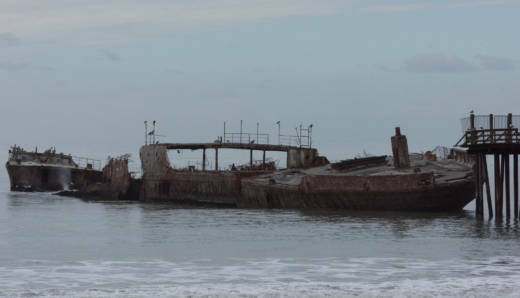 The ship, also known as "The Cement Boat," is docked at a pier in Seacliff State Beach, south of Santa Cruz. National Weather Service meteorologist Steve Anderson said that swells in Monterey Bay reached about 34 feet on Saturday, setting a record over the previous swell height of 32 feet in 2008. On Sunday there was a high surf advisory in effect through early Tuesday, with waves forecast at 15 to 19 feet. The S.S. Palo Alto was built in 1919 as an oil tanker by the San Francisco Shipbuilding Company, but it never went into wartime service. It was later bought by the Seacliff Amusement Corporation and towed to Seacliff State Beach, where it was refitted as an amusement ship with a casino and dance hall. It has been closed for decades and left in place as an artificial reef for marine life and a highly photographed landmark.